M Francis McCarthy creates emotive landscape paintings that capture the spirit of New Zealand. His art hearkens back to previous eras while also capturing the essence of a modern aesthetic. Having exhibited locally in the Whangarei area for the last several years, with galleries and in his own studio at The Quarry Arts Centre, this inaugural museum exhibit gives the public an opportunity to examine McCarthy’s poetic landscapes. Born in California with a background in the graphic arts, McCarthy has made New Zealand his home. 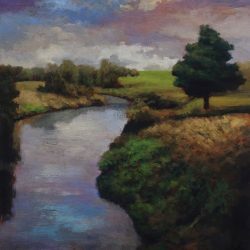 Since 2009 he has pursued his passion for landscape painting here. The two styles of landscape painting that have had the greatest influence on McCarthy’s development are The French Barbizon painters of the 1800’s, and The Tonalists, popular from the late nineteenth to the early twentieth century. Tonalism often uses a restricted tonal colour range to convey the artist’s poetic interpretation of a subject. McCarthy considers himself a Tonalist, but also is inspired by the Barbizon painters. His paintings sometimes reflect the style of artists such as Rousseau, Diaz, Daubigny, and Corot. In a Barbizon landscape, one feels that the landscape is painted from familiar experience. Barbizon landscapes are often uneven in texture and restricted to brown and green tones. In Tonalism, on the other hand, the overall colour and its intensity are often arbitrary with a hazy softness to the forms. Looking at McCarthy’s paintings one often experiences an intimacy with a seemingly sentient nature through the transforming effect of light on landscape producing a satisfying nostalgia that tinges our aesthetic experience. McCarthy’s landscapes share a recognizable manner that seems to rhyme effortlessly with the nature of the elements depicted. McCarthy seems more interested in the harmony of the whole composition than in rendering details. His technique and compositional choices yield an image that represents not only what he sees, but what he feels about the things he sees. Paint is dabbed on loosely, creating a gauzy, lyrical softness in many of the artists’ works. 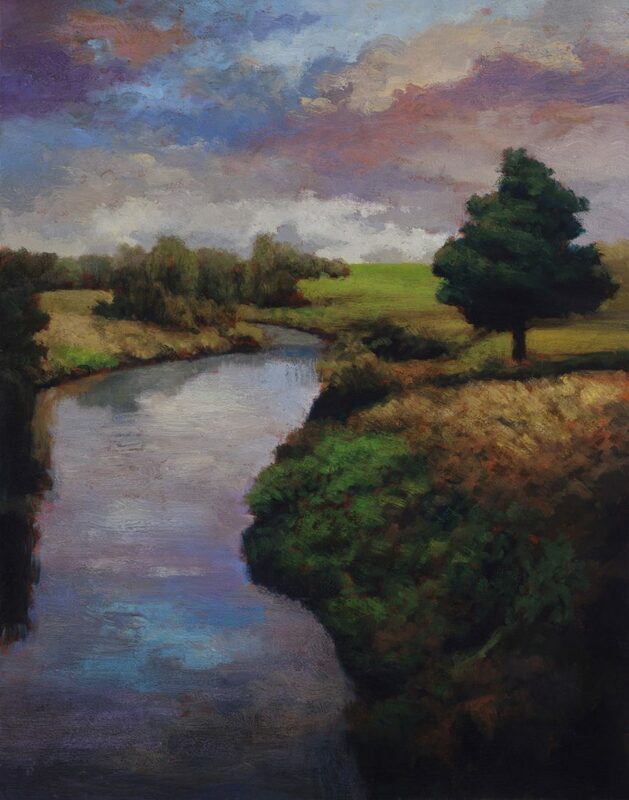 M Francis McCarthy is continuing his journey in developing his landscape painting. We hope that through this exhibit, you the viewer, will experience the memories, passions, and visual pleasures these beautiful landscapes convey. Indeed, visual poems can be painted.